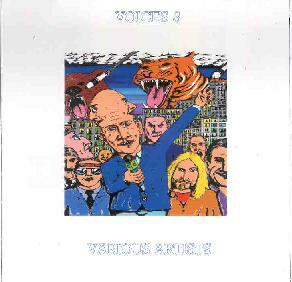 Various Artists - "Voices 3"
Voices 3 is the third collection put together by Paradox One's Phil Jackson of "mostly solo artists everywhere working within the broad church of progressive rock and imaginative musics". Strongly participating on this release is AI favorite Rick Ray, who not only contributes the title track from his Guitarsonist album, but also plays on Wil Burton's folksy ballad The Way It Goes, and provides the colorful artwork for the CD. That being said, it's safe to say, I think, that if you like Ray's diverse style of sound that combines Beatlesque pop with a Frank Marino-like searing guitar-style, you will enjoy a lot of what this compilation has to offer. Not to say that it all sounds like that. Far from it, there is certainly a diversity to the songs, from the symphonic keyboards of Fonya's Chris Fournier (recording as Centric Jones) on Let Go Your Course to the eerie and chilling electronic drama of Kosovo by Djam Karet's Gayle Ellet (recording as The Maskit Chamber). Former Hawkwind bassist and current Bevis Frond player Adrian Shaw also contributes the 9-minute long melodic psychedelic rocker, Don't Think So, also featuring Bevis Frond frontman Nick Saloman. We also get a contribution from Mike Oldfield's nephew Matt Oldfield, which sounds nothing like what his uncle does (nor, for that matter, what his father Terry does). It's a gritty, bluesy, spiritual ballad called Another Man's Prophecy. Phil Jackson himself throws in a Paradox One tune, the multiple keyboard instrumental From the Void. Also on the collection are the mellow People Listen! by Joshua Charles and the Rush influenced Mere Mortals by Reindel. None of the songs are original to the collection, but for the cheap price, it's a nice compilation of cool tunes by a diverse group of artists, and just may allow you to discover a few new "voices" you have not heard before. Visit the Voices website at: http://www.stuarthamilton.f9.co.uk/paradox/voices.html.